Two-ply tissues are soft, strong and absorbent. Color contrast sheets let you know when it's time to refill. Standard flat box features elegant iris emboss. 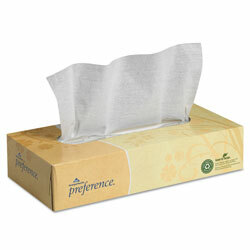 Tissue Type: Facial; Number of Plies: 2; Number of Sheets: 100 per box; Length: 7 13/20". INNER PACKAGING: 30 Boxes. 100 Tissues Per Box. White Facial Tissue from Georgia Pacific! 726 In Stock today.